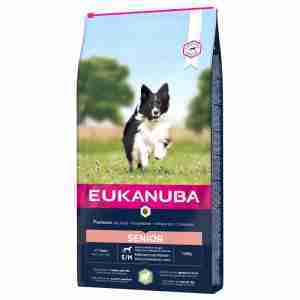 Eukanuba Mature & Senior All Breeds Rich in Lamb & Rice provides optimal nutrition for aging dogs with a sensitive skin and tummy and those who prefer the taste of lamb. It contains high quality and easy to digest lamb meat for excellent nutrient absorption. This food is also formulated to help support optimal weight, healthy joints, healthy skin and coat and strong immune system. It contains ingredients such as high quality animal based protein (chicken is the No 1 ingredient and lamb 2nd,) fats, carbohydrates and fibres as well as important vitamins and minerals necessary for optimal health. Prebiotics and clinically proven beet pulp to promote digestive health and optimize nutrient absorption. Contains calcium, clinically proven to help promote strong bones. Optimal ratio of Omega-6 and 3 fatty acids helps promote healthy skin and radiant coat. Clinically proven antioxidant helps promote strong natural defences. 3D Dentadefense - crunchy kibble helps remove deposits from your dog’s teeth. After he eats, special minerals keep tartar-forming materials from attaching to his teeth. Lamb (>14%), rice (>14%), chicken meal, sorghum, barley, maize, poultry meal, dried beet pulp, dried whole egg, chicken digest, animal fat, brewer's dried yeast, potassium chloride, salt, sodium hexametaphosphate, fructooligosaccharides, fish oil, DL-Methionine, glucosamine hydrochloride, marigold extract, borage oil, chondroitin sulphate. [for < 10 kg] Contains EC permitted antioxidants. [for >= 10 kg] Contains EC permitted antioxidants: tocopherols and propylgallate. Vitamin A:14000 IU, Vitamin D‡:750 IU, Vitamin E (à-tocopherol):200 mg, Copper as Copper II Sulphate:20 mg, L-Carnitine:40 mg, ß-carotene:1 mg. No colorants or preservatives added. I noticed my Japanese Akita is much more mobile and alot happier. The food must be so gently to his stomach because his toliets alot smaller and easy to pick up. We`ve got a 11-year-old golden retriever and this food is extremely good for his joints; after a month we noticed a huge difference as he`s more mobile, started running and jumping. We`ve also noticed a big difference with his intestinal health. Lamb and rice is his all time favourite!